The way shops are doing vehicle inspections is changing for the better. If your shop isn’t taking on the new ways of digital inspections, you will eventually feel the impact. Customers are loving the new use of technology, the new level of transparency, and they are building a more trusting relationship with their automotive repair shop. Digital multi-point vehicle inspections are the NOW, not the future. When implemented correctly, the use of digital inspections can improve important KPIs such as efficiency, average repair order, and customer retention. Make your Shop Management System Mobile - start ROs from the vehicle! Meet your customers at their cars and walk around with them to make sure you’re seeing what they see. 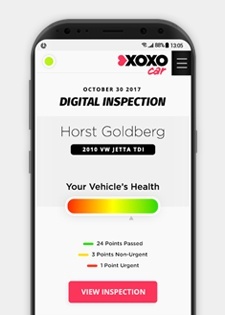 Send Inspection Results with Photos & Videos - send photos and videos of your customer’s vehicles right to their phone to help show the condition of their vehicle. Text Customers - let customers know when their vehicle is ready with a text for quick and easy communication! No more waiting for calls to be answered and voicemails to be returned. Scan VINs - decode VINs and license plates with the tablet camera for accurate and consistent reading that is integrated directly into your shop management system. Auto-Schedule Appointments - know your schedule weeks out by scheduling next appointments for recommended services before your customer leaves the shop. Increase Precision - real-time information to and from your shop’s management system. Within just a few weeks of implementing Mobile Manager, shop owners reported seeing an increase in their ARO that was almost double their old number. But besides that, customers will love the text messaging feature. Educating your customers with photos and videos is something that traditional inspections don’t offer. Customers want to know they aren’t being taken advantage of, they want to be able to trust technicians to do honest and necessary work. By actually showing them the repairs they need on their vehicle, you can close more sales. Transparency is key to up-selling customers who usually opt for the bare minimum. Hear from current customers on how digital inspections helped improve their shops efficiency! Traditional inspections are a phase of the past. They’re messy, inconsistent, time consuming, and questionable from the perspective of the customer. Digital inspections are the now and the future. With a digital inspection software, you have more accuracy, efficiency, and overall productivity.